In the aftermath of the death of 17 year old Trayvon Martin, there have been a lot of people using the slogan 'I Am Trayvon Martin' to show solidarity against the injustice that surounds the case. Regardless of race or socioeconomic status, people have united behind this slogan, until now. 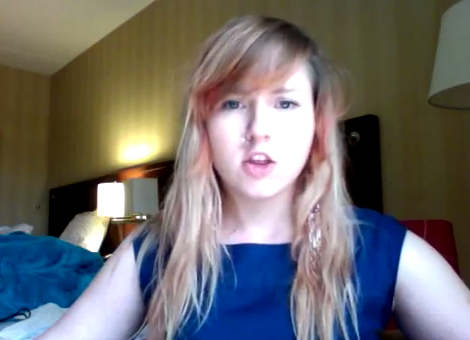 A young, white took to video to explain why she and her fellow white people are not Trayvon Martin. The video has subsequently gone viral since it's March 31st debut. I know you wear that shirt to stand in solidarity with Trayvon, Troy, and other victims of injustice. The purpose of those shirts is to humanize these victims of our society, by likening them to the middle class white activist wearing it. And once we’ve humanized the victims, this proves to us the arbitrariness of their deaths and thereby the injustice at play. But the fact of the matter is that these men’s deaths are anything but arbitrary. The fact that the real Troy Davis and Trayvon Martin and countless other victims of oppression are buried under 6 feet of cold dirt while we middle class white activists are alive, marching, and wearing their names is an indication that our societal system is working exactly as it’s intended. A more accurate t-shirt to display on my white body would be “I AM GEORGE ZIMMERMAN.” Zimmerman and I were indoctrinated in the same American discourse where we learned that the “other,” particularly black men like Trayvon and Troy, were less human and were to be feared. Society taught me that as a little white girl, I must preserve my purity and goodness, and that the presence of young single males threatened it. Society taught me that being in the presence of a BLACK man compounds that threat exponentially. I have been taught that male, black, bodies are an immediate threat to my safety and the well being of society as a whole, and Zimmerman was taught the same damn thing. We’re all taught it. This young lady gives me hope that maybe some people are actually starting to get it. It's just to bad she can't sit on a jury. she all good on that camra but she would not have the guts to say that to his family.